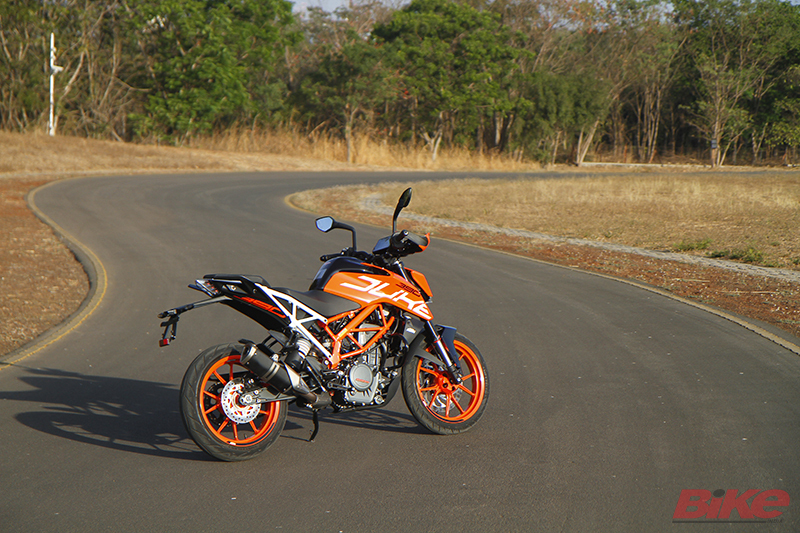 Firstly, this is not a facelift and there’s nothing half-hearted about the new 390 Duke. KTM has given it a major re-jig that makes the 2017 Duke 390 a huge improvement over the older one. Most surprisingly, there is hardly anything we can complain about, going by our short ride experience on the track today. 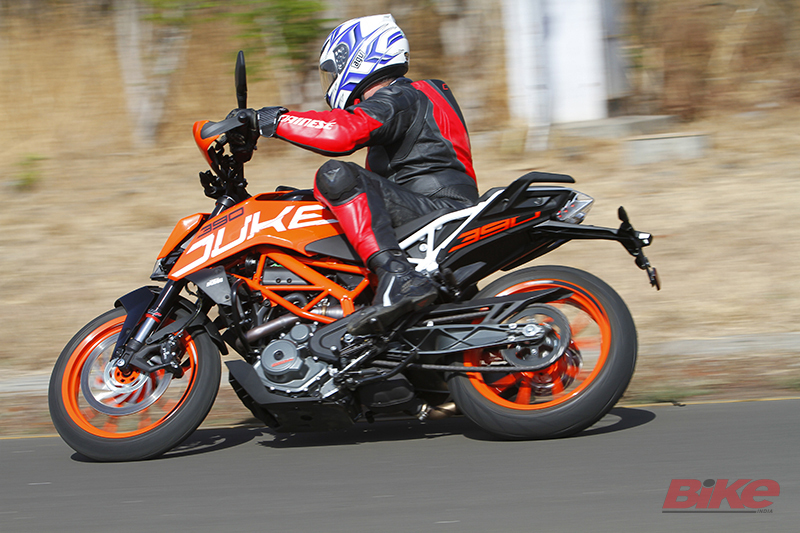 Compared to the out-going Duke, the new 390 is light years ahead. And we just don’t mean this in terms of features and gadgetry, but purely as a bike and how great it is to ride now. The biggest and most important change, or shall I say improvement, is the new fuelling system. A lot has gone in behind the scene to make the 2017 390 Duke smoother off the mark, and in terms of how intuitive it has become; even when one twists the throttle coming out of a fast corner. A big thumbs-up to the new intake and exhaust system, the 46 mm throttle body and the precise fuel injection system. 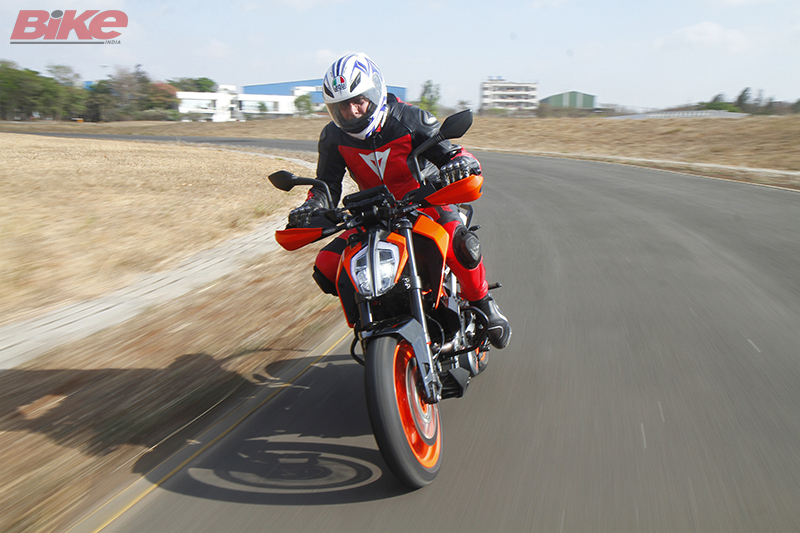 Not to forget, a vital addition is the ride-by-wire system which give the KTM a smooth and crisp throttle response. Since there’s no throttle cable, it electronically conveys the throttle commands of the rider to throttle valve positions. So, at all times there’s just the perfect blend of power and torque on the tap, make the new 390 perfect for pretty much every kind of rider. The power delivery is leaner and the throttle never feels as scratchy as the older 390 Duke. Many aspiring KTM 390 Duke buyer gets intimidated during the initial test ride, due to it burst of power, especially while negotiating city traffic. This has been ironed out, and how! 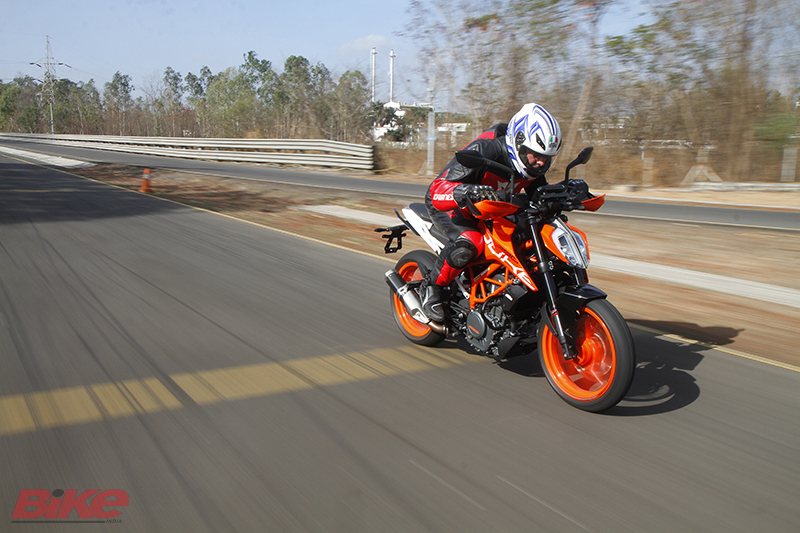 But it’s still packs every ounce of fun and excitement that you’d expect from a KTM. Don’t mistake its smoothness for dullness though, because the KTM is seriously fast. Wring the accelerator, and before you know it you’ll be catapulted past the 150km/h mark! Though it is still powered by the 373-cc liquid-cooled single that punches out 43.5 PS at 9,000 RPM. But thanks to the new fuelling system, exhaust and ECU mapping it now produces 37 Nm at 7,000 RPM – that’s 2 Nm more than the older 390 Duke and one more than the new RC 390. This is mainly to compensate for the 5 kg weight gain, and to fit in with the new all-rounder character of the bike. To keep the bike as engaging, if not more so than before, the swing-arm has been shortened by 10mm and a new WP open-cartridge (easy to maintain) up-side down front forks have also been included in the package. The setup gave outstanding stability at high speeds, and equally nimble characteristics to dominate the corners. And in spite of the steel trellis frame now being split into two sections, it continues to offer good torsion rigidity. And the tyres further boost your confidence. The Metzeler tyres on the current Duke did win everyone’s heart by virtue of the top-class grip it had to offer. But when it comes to replacing them, the hefty price tag would burn a hole through the pocket. KTM has tried to address this as well on the new Duke which comes with more durable Metzeler tyres, which are also rated for a higher speed. New compound offers grip that is as great as before, and at the same time promises longevity and comes at a more affordable price. The 6-speed gearbox continues to come with slipper clutch, as before. But now the new Duke comes with 2-channel Bosch ABS which can be switched off completely or, in supermoto mode, can disengage from the rear wheels helping fast riders to drift through corners. Stopping power has been improved with larger 320-mm front disc sourced by Bybre. The saddle is larger and softer – which gives the rider more room and should be a lot more comfortable during longer rides (compared to the wooden seats of the out-going Duke). While the new larger 13.4-litre steel fuel tank (older was 11.5-litre) will come in handy during long rides and touring. For the price, the fit and finish is decent and like the 2017 RC 390, the new 390 Duke comes equipped with better rear-view mirrors, adjustable levers, CANBUS system, and E-Vap unit. 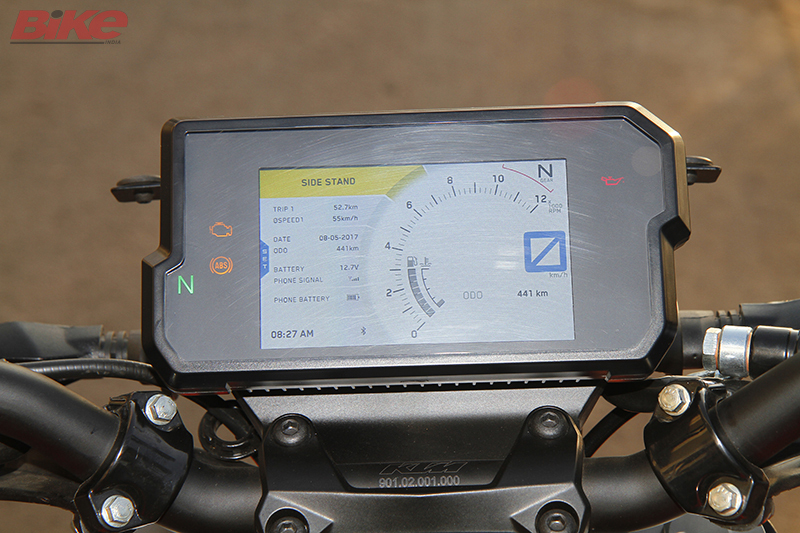 The switch gear is all-new too, and comes with new buttons on the left side of the handlebar which helps you navigate through the much-talked about TFT display. This give the rider a whole bunch of information. You can also use the My Ride feature to connect your smartphone. 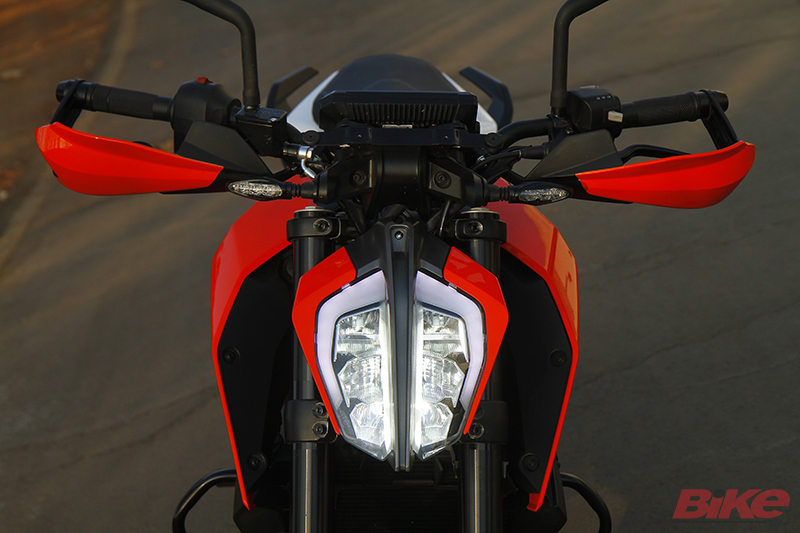 And yes, it does look a lot like its elder sibling – the KTM 1290 Super Duke R – right from the tank extensions to the 20 LED-equipped split headlight. Now for the two most important parameters for the average Indian customer – fuel economy and price. 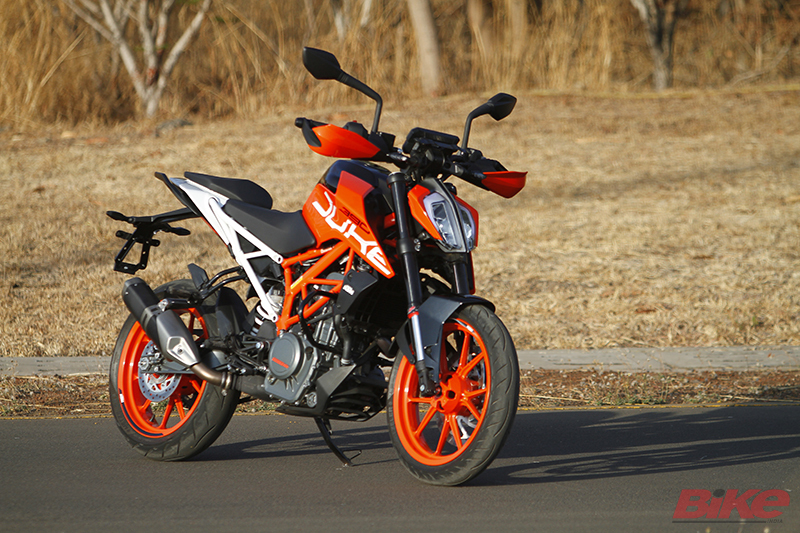 The new 390 Duke is comfortably capable of doing 25-30 km/l, if not more. In terms of price, you’re looking at a sticker of Rs 2.25 lakh (ex-Delhi). To wrap it up, the 2017 KTM 390 Duke is a lot more versatile and useable now, without really losing its core KTM character. It’s fast, well spec-ed, looks like nothing else on our roads and is extremely well priced. So, stop being a cheapskate by trying to find out how many of the new parts will retro fit on your old 390 Duke. Just trade it for new one!